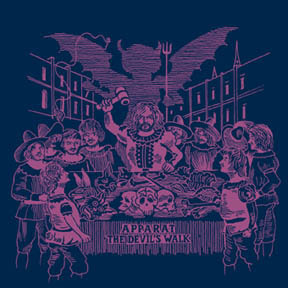 Record review: Apparat, The Devil’s Walk | Professional losers. Check it. Too often ambient equals mundanity. Less can be more, especially if you’re a soundscape wizard like Berlin producer Sasha Ring. Those who know his back catalogue are aware of his command of techno tempos, glitchy beats long before James Blake even touched a synthesiser. On The Devil’s Walk he’s veered left on the electronic path to create a record that is immersive sonically and an imaginative take on a genre done to death. A record like The Devil’s Walk needs that one core song that forms the emotional centre, thematically tying in all the tales of love gone and lost girls. Here it is Goodbye, sung by Anna Plaschg of Soap&Skin. Her timid whisper of ‘please put me to bed and turn down the light’ speaks volumes of vulnerability, as the piano overpowers it and builds into her voice rising in the verses. It’s a devastating song that speaks of clinging to the final remnants of sinking hope. Elsewhere Ring aims for uplifting with frenetic strings meeting sampled sounds on The Soft Voice Dies. Astute fans will notice that the male voice is of Ring himself, a relatively new move for him to be singing on almost all the songs. One wonders why he didn’t start sooner after hearing his pitch-perfect delivery on the musically sparse Escape. Lead single Black Water falls into the simplicity of vocals backed by a steadily pulsing beat that suspends listeners till the end. The Devil’s Walk is a piece worth mulling over, for sitting down and really paying attention to the crafty nuances Ring has inserted for our listening pleasure. This entry was posted in Cd Reviews and tagged anna plaschg, apparat, cd review, record review, soap&skin, the devil's walk. Bookmark the permalink.